Some may say that the envelope doesn't matter, that it's the inside that counts. But if you think about it, the first thing you notice as you flip through your mail isn't the content inside, or the address, it's the envelope. 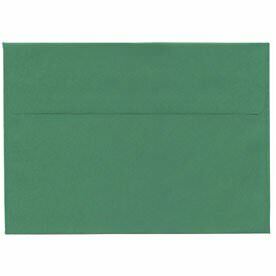 With these 5 7/8 x 8 1/4 envelopes, you are sure to make a statement and realize the importance of that statement. Your recipient will take one look and desire to open it immediately. This unique size is perfect for those oversized invitations you won't be able to fit in an A8 envelope. Or use this 5.875 x 8.25 envelope for those special notes to your family or friends. Each of your envelopes in this collection has a straight flap for a modern look and a gum closure for a secure fit. Some are even 30% recycled, perfect for all of your environmentally friendly goers. To make your envelope stand out even more, we've given you amazing colors to choose from. All you need to do is a pick a favorite and go! Try our Red 5 7/8 x 8 1/4 Envelopes to capture the perfect Christmas card or try our Lilac 5.875 x 8.25 Envelopes for a nice invitation for your birthday party. We even have green and blue, for a sweet touch to your announcements. Don't disregard a great envelope like this and start shopping today!